The first order of business for fire season 2004 was to go get the helicopter, something a little less complicated than cooking one of my wife’s gourmet dinners, and a whole lot more complicated than cooking one of my dinners (which typically consists of opening a can of chili beans). Unfortunately for me, and fortunately for the helicopter, the Bell 212 had been wintering in Mazatlan Mexico and needed to be flown to Fresno California, where it would be prepared for the 2004 fire season. Since I needed some recent flight time in the 212 to prep for fire season, I flew down to Mazatlan via Phoenix on Mesa Airlines. As the 737 taxied in to the ramp I could see the Bell sitting on the far end of the ramp. Its big twin engines called to me and foolishly I thought, “Soon I’ll be dancing the fat girl all the way up the Mexican coastline and starting the first leg of Fire Season 2004!” Silly me, nothing is ever that easy, and it’s doubly difficult anywhere in Mexico. First things first…Got Gas? Since my Spanish consists of adding an “o” or an “a” to the end of any English word to make it Spanish, I asked for “Gasolina.” Oddly enough, that was actually the word for “I need gas, but I want to do the maximum amount of paper work possible” so I was soon hip deep in the Mexican Bureaucracy while attempting to keep a smile on my face. After making my request, I filled out two separate forms and walked between different offices to get each form stamped numerous times. Finally, the fuel was delivered to N212TH. After being refueled, I made the mistake of asking “What next-o?” and found that “next-o” meant filling out several other forms and paying for Parking fees, Landing fees, overnight parking fees, security fees, flight following fees, flight Plan fees, and to top it all off, Flight Plan filing fees!! None of Rogers’s credit cards worked and cash was not accepted (they prefer you save your cash for tipping them to do their jobs), and soon my well-worn USAA credit card came out as a last resort. As the card was swiped throughout the credit card machine I had visions of staying in Mazatlan for a few days of sport fishing and waiting for the Bureaucracy to get sorted out. I’m extremely fluent in the language of Mexican food, and all I wanted was a chance to say “Cervesa! Taco! Enchilada!” Alas, “gasolina” and “next-o” were to be my largest forays into the Mexican language, because USAA’s credit card worked and we were soon cranked up and on the way back to the USA. Meanwhile, back home, Shirley Jean got a concerned call from USAA’S security guy inquiring (and I’m sure hoping) if by chance yours truly was in Mexico charging large amounts of Jet A fuel to his card? Over the past 30 years, Shirley has come to realize that I love to use my USAA card and that I have somehow maintained the childlike belief that my employers will pay me back promptly and efficiently. In fact, the Forest Service STILL owes me, but Shirley has given up on that fight. Anyway, Shirley assured them that I was indeed in Mexico flying a helicopter, and the USAA folks breathed a sigh of relief. That night after a beautiful flight up the almost deserted coastline we landed in Los Mochis. RON (remain overnight) in Los Mochis and the next morning we again tackled the bureaucracy. We had wised up a little, and quickly engaged the Commandant’s son to wash the helicopter. Soon a clean helicopter was on the way up the coast. This scene was played out to one extent or another at every Mexican Airport, some times it was just a few bucks to lube the slow system, but one thing for sure, pilots with little patience need not apply. Every airport had a detachment of Mexican Military to provide security and I found them to be well-behaved and friendly without fail. As far as the mind numbing bureaucracy, when in Rome do as the Romans do, good advice for anyone. Keep your demeanor friendly and relax…are we having fun yet? Soon I was back in Fresno and had turned up at Rogers Helicopters like a bad penny. I was welcomed back into the fold and the tender mercies of the Chief Pilot Larry Holdridge. 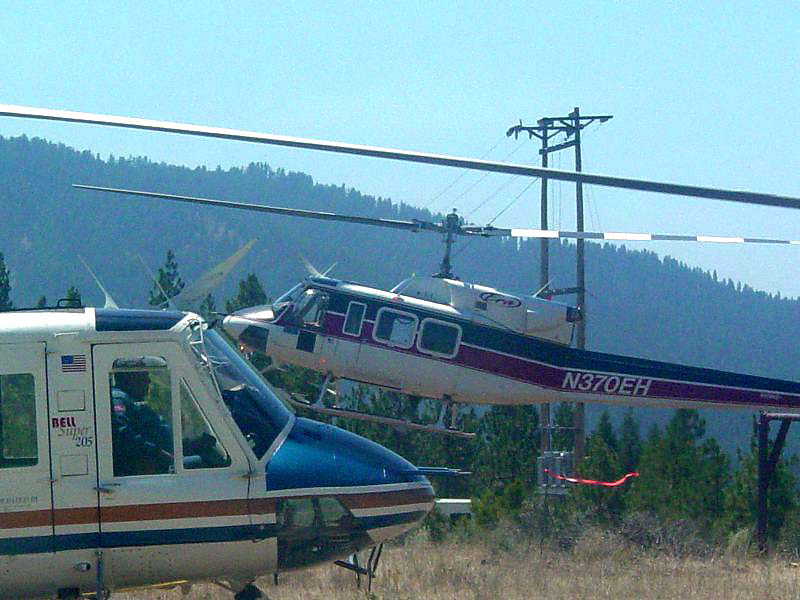 When people ask, I explain that I loved Idaho Helicopters’ equipment, but with the Right to Work law in Idaho, it means your pay can be much lower than working in California. I’m not completely mercenary, but want to get paid for all the time I’m due. Holdridge is in fine form, he’s a retired LA Cop and served in the Marine Corps in Nam, so I never have to wonder how he feels about my flying. Soon I had my 135-ground school completed, check ride passed and with a new USFS card I’m ready to fly the Fire Season 2004.